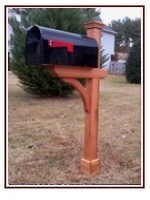 Southern Post and Box offers homeowners a choice of handcrafted Western red cedar or distinctive aluminum mailbox posts. The overall post length allows for a secure in-ground placement in concrete and a U.S. Postal Service approved mailbox height of 42" - 46" from the ground surface. Our handcrafted Western red cedar mail posts offer exceptional beauty, durability and a truly sustainable material. Western red cedar is environmentally friendly, unlike posts pressure treated with chemicals, and is harvested legally in sustainable managed forests. In addition, it contains a natural fungicide which makes it resistance to decay and rotting. 5"square post: Crafted Western red cedar - 6 high base cap - smooth or fluted surface - standard post cap - can be painted or stained. 5x5 solid Western Red Cedar. Our top seller. Specially milled just for Southern Post and Box. Perfect for those who think the 4x4 is too small and the 6x6 too large. 6" base trim and post cap. 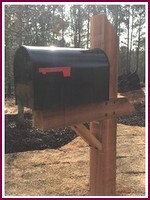 Shown with natural stain, copper vein Newport mailboxes. natural stain and black Newport mailbox. 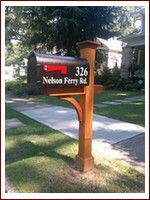 Shown with a Copper Vein Belmont mailbox. Natural stain.. 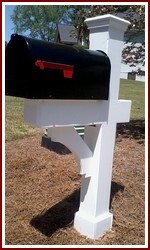 Shown painted white, and 2 black Newports mailboxes. sleeve and crown mould top cap. Post only, mailbox and numbers not included. 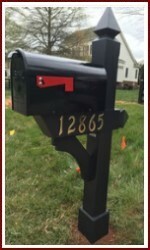 Shown painted black, pyramid post top, decorative bracket and black Newport mailbox. 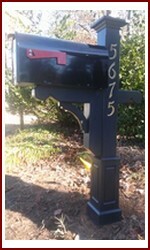 Shown painted white and black Newport mailbox. Full size 6x6 Rough sawn Western Red Cedar post. $350. The 4 square aluminum post is available in three distinctive styles: the Victorian with a stylish, yet slim 1/2x 19 decorative scroll brace, the Contemporary with a slim ½x19 modern decorative brace and the Charleston with a sturdy 3x 19 decorative brace. 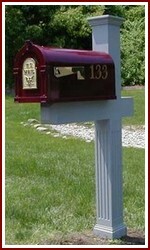 All 7 colors available for mailboxes are also available for aluminum posts. Dont see a post design that meets your needs? Let Chris, who has more than 20 years experience as a trim carpenter, handcraft a post to match your homes architectural style or your individual taste. In addition, he can paint or stain the post to fit your homes color scheme. Please look at these examples of his work and call him today! "DON'T buy a cheap post from the large home improvement stores! Call and find out how inexpensive it can be"
For more information and reviews please click these sites.